Boots wet from crossing the small river, you tramp up onto the remnants of an old road. A small village lies before you. It’s mostly wooden cottages stand arrayed in neat order along either side of the road. The dinner hour is only just passed and the town is muted and dark. Shutters and doors are tightly closed, and the gentle clanking of your armor and equipment echoes in the still quiet. No dogs bark. There is no sound but the ragged breaths of your tired band. Lord Galveston’s lands are plagued by murders. For the past several months people have been disappearing. Some bodies have turned up, their corpses found along the banks of the river. Strange tracks of a cat-like creature have been found around the villages, and rumors abound that a charon fiend, a dreaded beast of chaos, has come from the nearby wood and settled in the area. The latest victim is the Deacon of the Four Saints Church in Capendu. His body, found in the river, sent the alarmed villagers in search of aid. The adventure unfolds in the lands of the aged Lord Galveston and plunges everyone into a twisted tale of wild beasts and the restless dead. 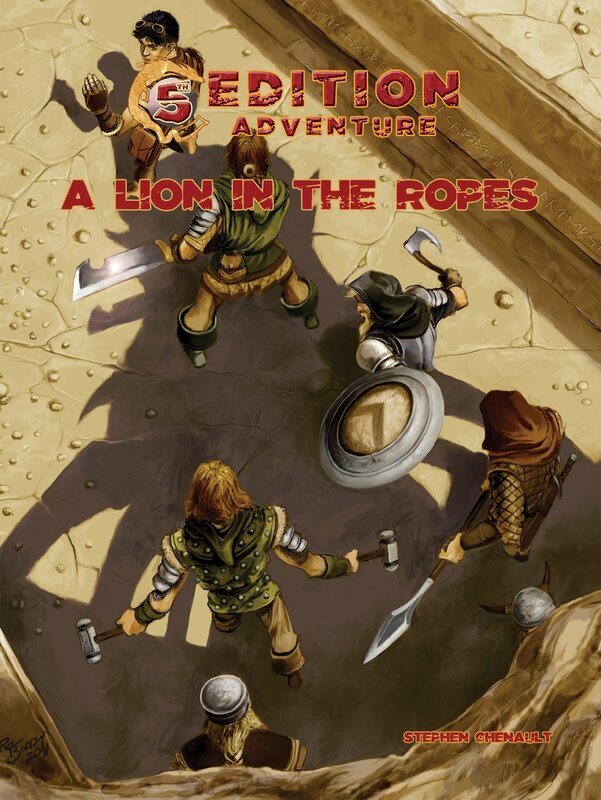 Unriddle the adventure and discover the truth behind A Lion in the Ropes. This adventure is designed for 4-8 characters of 1-4 levels. Overland. Dungeon. Action.